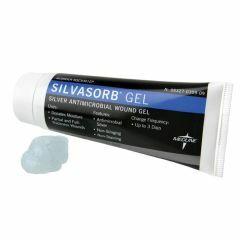 SilvaSorb Hydrogel helps hydrate dry wounds and maintain an optimally moist wound healing, which is a key factor in wound healing. SilvaSorb Hydrogel offers antimicrobial protection over a broad spectrum of bacteria and fungi, including MRSA (Methicillin-resistant Staphylococcus aureus) and VRE (Vancomycin-resistant enterococcus). SilvaSorb kills microbes, but is completely biocompatible with the tissue cells of healing. Easy to Use: Easy to spread and won't melt into the wound. Donates Moisture: Hydrogel helps hydrate dry wounds and maintain an optimally moist wound healing environment. Reduces Bioburden/Contamination: Effective against a broad spectrum of bacteria and fungi, which reduces the risk of infections later on in the healing process. Promotes Healing. Easy To Use. Effective. Safe. Aids bed sore healing. Keep a clean wound clean. Long Term Use. Emergency Preparedness. Keep In The Medicine Cabinet. CPR Trained. Former EMT/now caregiver. Promotes Healing. Easy To Use. Effective. Safe. The Best Product for open wounds!!!!! Long Term Use. Keep In The Medicine Cabinet. Emergency Preparedness. Quick Fix. Keep In The Trunk. This gel healed my mother's pressure sores which she received from surgery when no other gel/ointment would. My husband has had a stage ulcer for over 5 years, he has been on numerous treatments with the VA and it has went from three tunnels with exposed bone and infection, 5 inches deep... to 1 narrow tunnel about 3" deep But it has remained this size for almost 9 months now... is there any thing you can recommend to help this close up from the inside? Asked on Feb 8, 2012 1:48:17 PM by Penn from Somerset, PA.
Silvasorb, along with MelgisorbAG (alginate dressing)and Puracyn wound cleaner have help my wounds. That is a long time, I would try the wound vac with the white foam in the tunnels for now & aquacel ag after the tunnels are gone. I would try a wound vac and if you can't buy one see if insurance will let you rent it once a month until healed. Get a RX for Santyl ointment to debride wound. Use WounDres collagen hydrogel to keep wound moist and promote healing of wound. Reposition patient every two hours to alleviate prolonged pressure on wounds. Use a alternating air mattress to alleviate pressure on wounds. Asked on Sep 28, 2011 6:02:42 PM by Ray Ray from Newport News, Va.
silver is a known antimicrobial. can CURE AIDS, look up colloidal slver. It is not a medication so need no fda approval.It is an inert element.Excellent wound treatment.